Hey everyone! It's been a while hasn't it? (Well, a week but still!) I intended to post a then and now piece on Saturday but I didn't find any time to edit the pictures before I went home for the weekend and I didn't take my laptop in case I fell over in the snow, so here is my first chance to post. But rather than doing my then and now post I'm going to show you some different nails that you will have seen slightly already if you're following me on instagram, and I shall post my then and now nails this Saturday instead. I have quite a busy week planned in blogging, the only day there will be no post this week will probably be tuesday (aka tomorrow). I have some wonderful new Barry M nail varnishes to show you, and lots of lovely nail art ideas planned around them, and I also have other exciting products and designs to show you, so I hope you'll stick around to see! Anyway, on to today's nails. Last time I did paisley nails I had a couple of comments that I should try them in different colours, because as you might recall I just did them as a test of gel pens on top of some glow in the dark polishes, so the colours weren't that exciting. But I couldn't really decide what colour to choose and I've been meaning to do rainbow gradients for ages, so I thought why not, and I mixed the two together. The outcome reminds me of some hippy fabric in the 60's but I quite like it! 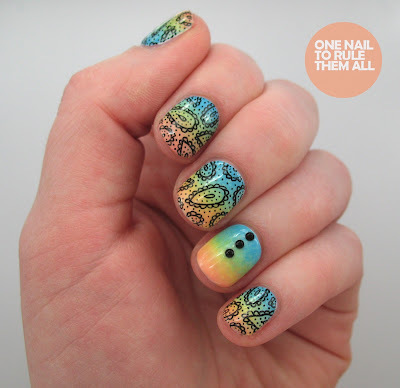 I've also included a picture of the rainbow gradient alone at the end of the post just in case you dont like the paisley! I used Essie - Blanc as a base and then sponged on Barry M - Lemon, Collection 2000 -Fruit Loop, Barry M - Blueberry, and China Glaze - Refresh Mint. And once that was completely dry I drew on the paisley print with a 0.38 Muji Gel Pen (seeing as though so many of you asked me what I used last time). Unfortunately I wasn't patient at all with top coat and I did smudge the pen a bit, but that's not the case usually, I was just a bit hasty. Although I dont think it looks too bad really. I decided to also add an accent nail using Born Pretty Store studs like the ones in this post. I think my gradienting skills could probably do with a bit of improvement still but I still like how these turned out! What do you think? I love the way this looks! You are great with a gel pen haha! I just can't get enough of your paisleys :D ! 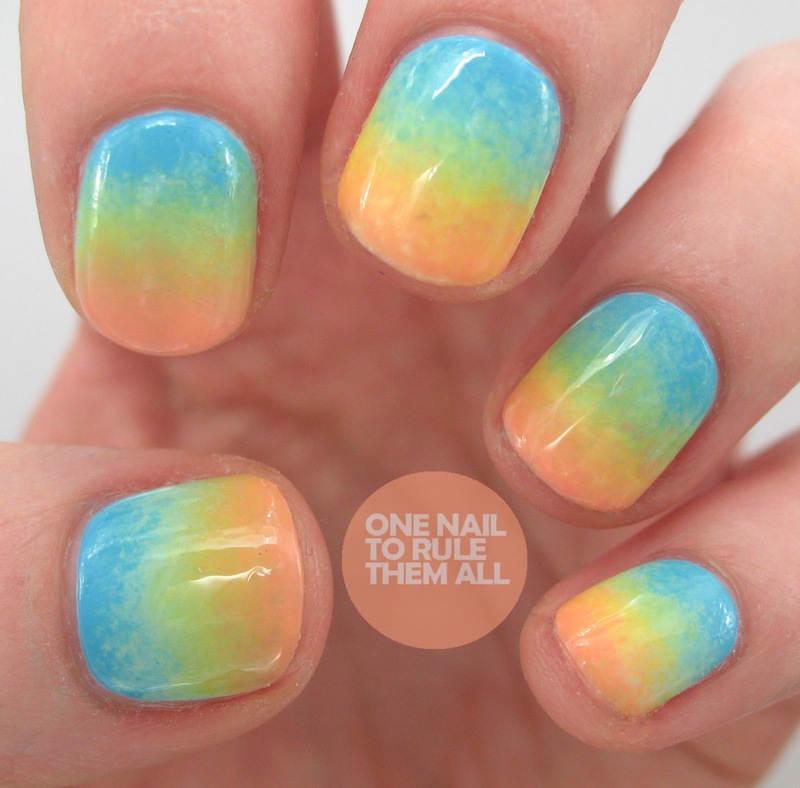 That rainbow gradient is to die for! 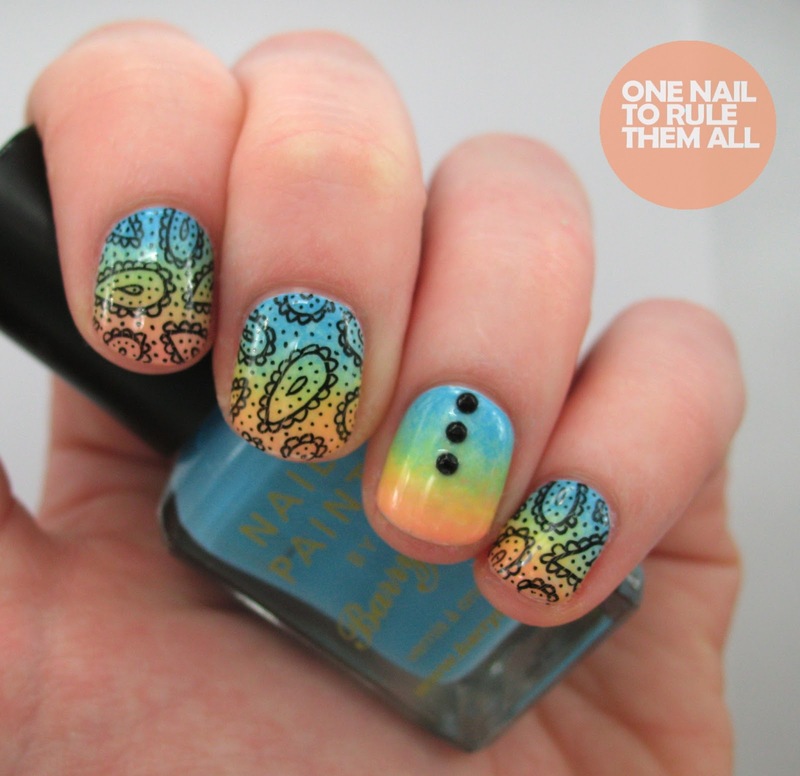 The paisley is also gorgeous but that gradient.....LOVE. Wow thankyou, I'm not very confident about my gradienting skills so that means a lot! I love that gradient, it's so nice! You're also making me want to buy a gel pen for nailart, haha. I'm just in love with the gradient and the little paisley design - basically everything about this! Wow, I am LOVING that gradient! 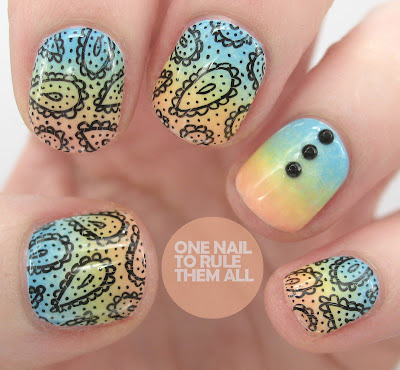 The soft rainbow colors are so pretty, and you can never go wrong with a paisley pattern! Well done!! Hi!!! I really really love this design. I am not sure if you are familiar with Bundle monster, but they sell nail stamping image plates similar to Konad. well they are having a contest to create an image that can be chosen to be featured on their new stamping plate collection and I would Loooove to see this design as a stamp. 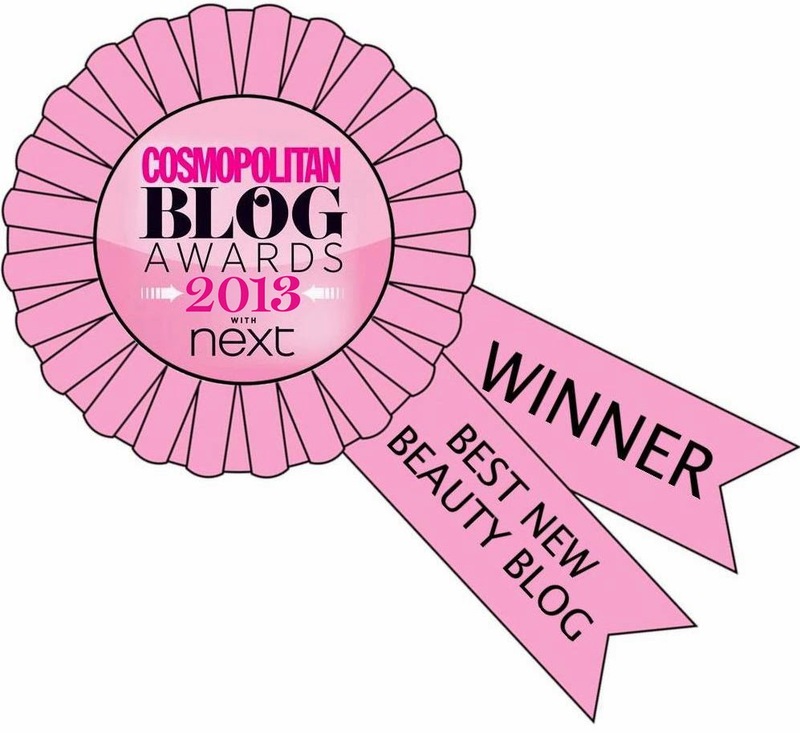 You should consider entering! !